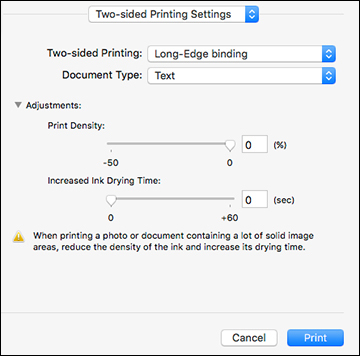 How do I enable automatic double-sided printing for my product in Windows or on my Mac? You can print on both sides of the paper by selecting one of the 2-Sided Printing options on the Main tab. Auto (Long-edge binding) to print your double-sided print job by automatically flipping the paper on the long edge. 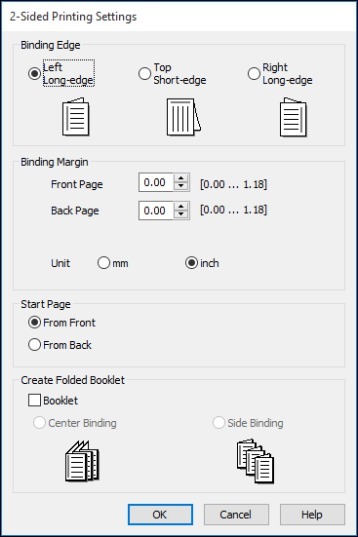 Auto (Short-edge binding) to print your double-sided print job by automatically flipping the paper on the short edge. Manual (Long-edge binding) to print your double-sided print job by printing one side and prompting you to flip the paper over on the long edge to print the other side (recommended for paper types that do not support automatic duplexing). Manual (Short-edge binding) to print your double-sided print job by printing one side and prompting you to flip the paper over on the short edge to print the other side (recommended for paper types that do not support automatic duplexing). 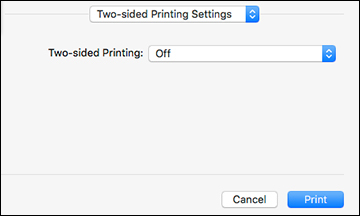 You can print on both sides of the paper by selecting Two-sided Printing Settings from the pop-up menu on the print window. Note: Some options may be pre-selected or unavailable, depending on other settings you have chosen or if you are accessing the product over a network. This screen may be different, depending on the version of OS X you are using. Select one of the Two-sided Printing options. 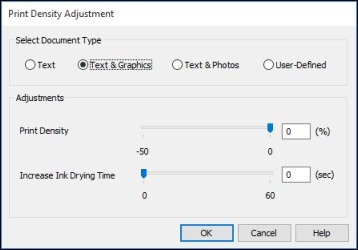 If necessary, customize the Adjustments settings as instructed on the screen.